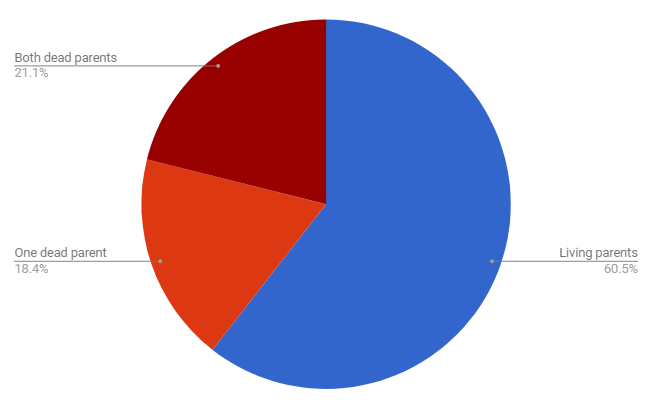 So most of you have probably heard about this in the Discord but if not I've taken it upon myself to get some data about all the characters we have approved so far. It's mostly basic stuff but I think its still nice to have it collected, and from now on new profiles can simply be added. This also means that if we want to collect stats on other aspects, then at least the basic stuff is covered so we need only look at specifics. 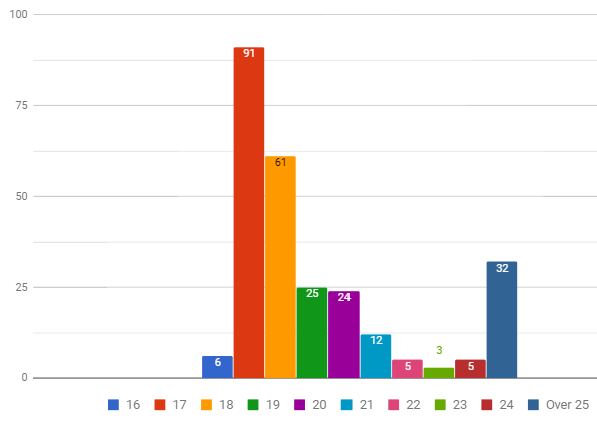 Unsurprisingly the most common age is 17 with the average being 20.5. 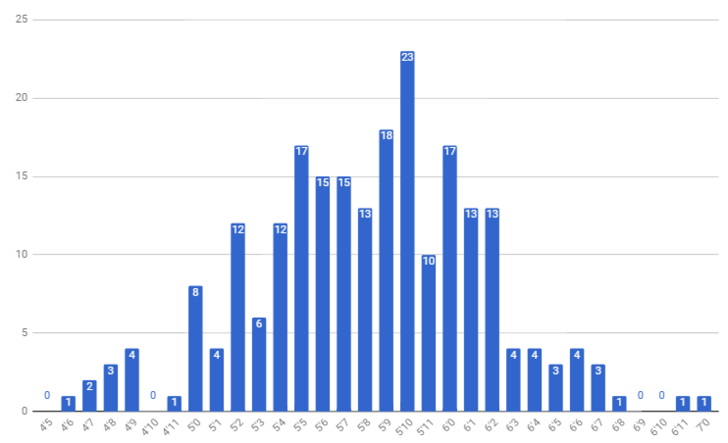 The ratio of women to men is pretty much even (133 female, 128 male). 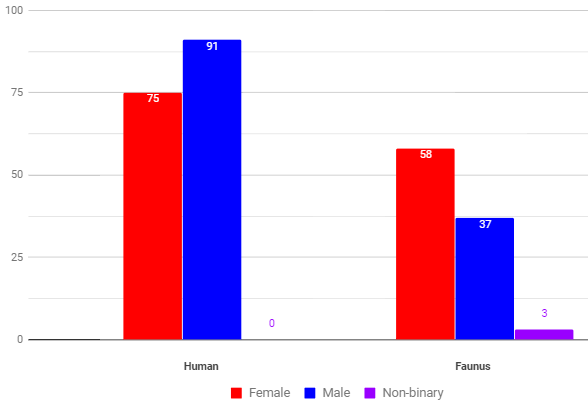 In regards to species women have a more even split, with 44% of female characters being faunus, whilst only 29% of male characters are faunus. 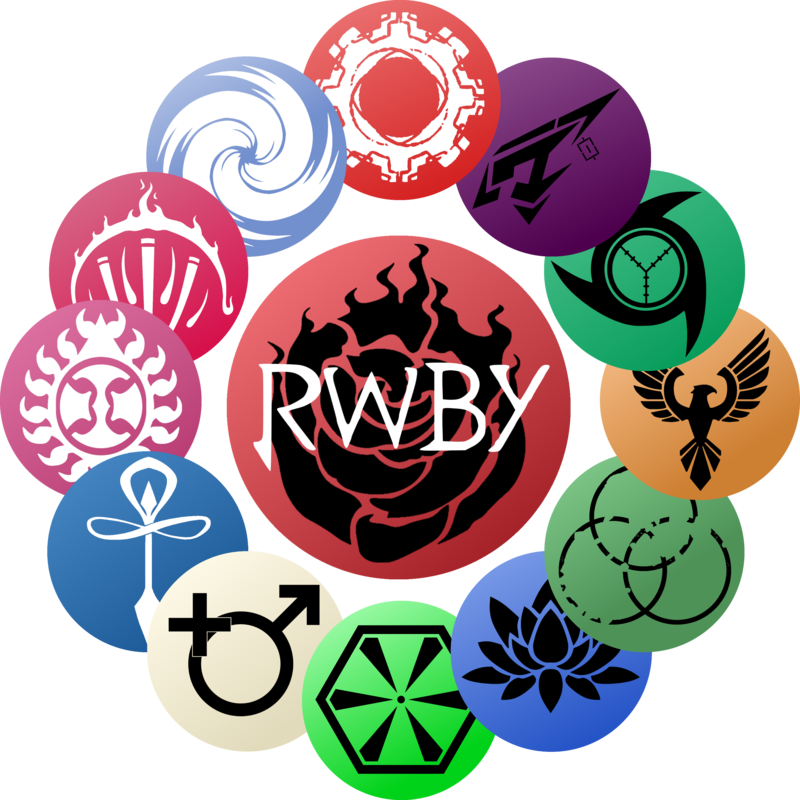 (Non-binary are 100% faunus, however that's just a sample size of 3). I've yet to come up with a way to present this graphically as its so varied, so for now I'll post some highlights here (feel free to check the spreadsheet for details). The most common species is fox, however with grouping the Felidae were more popular than the Canidae (24 vs 22). In total there are currently 41 different species. The most common traits were ears followed by tail, the third most common was profiles that claimed to be faunus with no written faunus traits. Couldn't really make a graph that contained the range of values here so a table will have to do. 155 parents have died for our tragic backstories (and 13 tows/villages). The semblance stuff changed a bit over the recording so this isn't finished atm. However based on what I have I can say that the most common semblances are in order; Shield, Enhanced senses, Speed, self movement manipulation, fire, electricity, none. This will be revisited next time I have time (Or if someone else is up for it). Far too much to organise graphically, so take a look at the spreadsheet. Link to the full spreadsheet (The Faunus species, and weapon sheets are probably the most interesting as they weren't graphed). At the moment only me and Kali have editing permission, whilst I'll try to keep track myself any staff involved in character approval are welcome to contact me for editing rights. EDIT: There are also bound to be a few errors in here, even when trying to do as quickly as possible this still took a few days work. If you see anything particular feel free to let me know here or on discord and I'll fix it. Hopefully it'll be a bit useful. Might expand on it in a few weeks, but for now I'll just keep an eye on whenever characters get approved. Yea this is really good work Vision. I do have one question for you guys, I plan to take another round after my exams (mid Julyish). What other things are you interested in finding out about? Two things that I'm thinking atm but would love some more suggestions. That would be interesting, but only problem would be that the vast majority of profiles will just be "no comment"
Marshal Oranzova- 1st Year Beacon Student, Leader of Team MARS - "Man, this is totally gonna cut into my nap." Robin Teale- 1st Year Beacon Student, Team TRTA - "That's the most dangerous thing I've ever heard. Let's do it." Glad you liked it I'll be going through some updates by end of next month so should hopefully improve then. Okay so one of the questions that I would like to investigate (and have had several other people ask me this) would be about sexuality, however this isn't really possible to figure out from profiles as very few include it. There is one way to do this which is a survey, as in I'll PM all members and ask them directly(A thread would have a too low response rate to be interesting). There are three questions to consider here then. A) Are people okay with a person doing this, I don't mind sending all the messages but if it's just going to lead people to be annoyed with me then I'd rather not. B) Are people okay with having their characters outed so to speak? I personally don't see the issue but still, this is a sensitive topic and would love to hear what people think. I could easily make it anonymous. C) And finally, if I am going to message all members It would be silly to just ask one question, so what other things could be interesting to ask. Need to strike a balance here, no more than three as that could get annoying to answer for people with multiple characters. A). So long as you make it clear what you are asking for, and making it as polite as your normal posts, I don't see why anyone would object-unless, of course, they have a personal reason why. In that case, I guess you could omit that character from the stats or mark them down as "Not included for reasons", etc. B). Personally I'm fine with it, but if they found it sensitive they would have refused you on part A already, I think. Making it anonymous is a good idea. 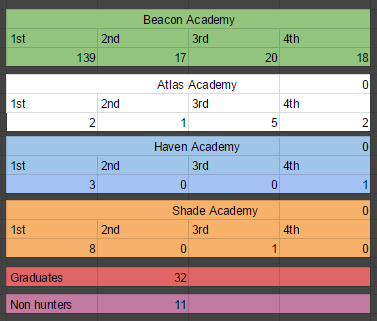 Would your character, if given the choice, still attend their current academy (if legible), join Beacon/ other academies, or leave altogether? And if so, what would they pursue? Battle styles (Hit/run, camper, brute force, swift strikes, buffs/debuffs, harassment, tank)? I can easily set up a system where only I will see everything whilst the names are censored for everyone else, think I'll leave that as an optional thing that people can opt into. The nationality question is really interesting but may end up being far too varied to give nice stats. Maybe the racism stat Kali suggested earlier? How people feel about faunus/those filthy animals feel about people? I think if you just boiled down nationality into which kingdom they were born in it wouldn't be too bad. I know I neglected to mention it on a couple of characters.